1. Central Station - Bar and Restaurant in the heart of Kings Cross, London. Long recognised as one of London's best and innovative independent late-night venues for the gay and lesbian community, Central Station has been widening its customer base. Down have come the shutters and huge improvements have been made to the interior and exterior of the venue. The bar is now open during the day and provides a service to the large and expanding office market in the area during the day and evening, as well as to the local people who live in the area with top-quality food and drink in the restaurant, bar and stunning new roof terrace. 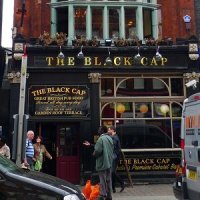 The Black Cap is one of London's best and most famous gay cabaret venues. Open 7 days a week. The upstairs Shufflewick bar plays chilled out current music and food daily whilst the club plays host to the crème de le crème of drag cabaret (for over 40 years) and current club tunes.